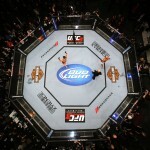 UFC on FOX: Velasquez dethroned by Dos Santos! I had the honor and pleasure to shoot the first ever UFC event on network TV this past weekend in Anaheim when UFC on FOX: Velasquez vs. Dos Santos kicked off from the Honda Center. I was shooting second camera for UFC and Getty Images down in the photo pit, and it was a great night of fights and a very fun experience. Spent the entire night shooting next to my good friend Ed Mulholland from ESPN. It’s always nice to shoot events with colleagues and friends. My friend Donald Miralle was up on the box for us and he got some great shots, as well. I mostly shot with my trusty 70-200 and switched off to the 8-15 fish-eye when it called for it. Have I mentioned yet that I love that lens? I’ll write a review in the next couple of weeks for anyone that’s interested. Ed and I also ran up top for the Semerzier/Peralta fight and shot from the Press Box at the top of the arena. I had a 400mm which I’m really growing to love. If only it didn’t cost as much as a car. That turned out to probably be the best fight to shoot from up top. I’ll give all the credit to Ed for making the choice on that one, I just followed his lead. We also rigged an overhead remote with a 16-35 which I ran all night from a foot pedal. I think everyone expected going into the fights that the Guida/Henderson matchup could be the fight of the night, and they did not disappoint. What a great performance by both fighters. It’s a shame one of them had to lose. Benson totally deserved that win, and it’s nice to see how his career has turned around since his loss to Pettis in the final WEC event last December. I really like his chances against Frankie Edgar. Before the main event, I said I thought Velasquez would take it. I really believed he would just take the fight to the ground and grind out a TKO or decision victory. But, I did say to Ed before the fight started, if Junior lands a clean shot, I don’t know how anyone could remain standing. I honestly don’t know how Roy Nelson was able to weather Junior’s shots. If you’ve ever seen Junior hitting mitts, you’ll know what I mean. To say he has some pop on his punch is such an understatement. And he proved me right when he landed what didn’t even look to be a solid shot, but in just the right spot, to drop Velasquez and then pounced and finished him on the ground afterwards. I didn’t get a clean shot of the punch that dropped him from my hand-held camera, but I did capture the whole sequence and Junior’s celebration on the overhead remote, as well as with the fish-eye. Junior’s celebration was about the best you could hope for when planning a remote. He dropped to his knees in the center of the cage with his arms stretched out wide and leaned back looking straight up at the camera. I’d like to extend a special thanks to Rebecca How for doing a spectacular job with the edit. And again, huge thanks and appreciation for my friends Ed Mulholland and Donald Miralle. Always fun working with/for you guys. And lastly, for Mike Roach and Kari Hubert. They help me out at practically every fight, mostly shooting backstage and behind-the-scenes stuff. They both delivered again with some really awesome, intimate shots. Here’s a teaser of my take from the night. Check out Getty Images for the full take from all our photographers. Greetings from Birmingham, England. I meant to get this blog post up sooner, but there just don’t seem to be enough hours in the day anymore. I had a great time again at UFC 137. The main coverage for the event was from my friend Jed Jacobsohn, but I did have a chance to shoot a little bit. My original intent was to run upstairs to the press box and shoot the two Spike TV fights (Tyson Griffin vs. Bart Palaszewski and Donald Cerrone vs. Dennis Siver) with the 400mm lens. However, Bart decided to end his fight rather quickly before I had a chance to get up to the press box. 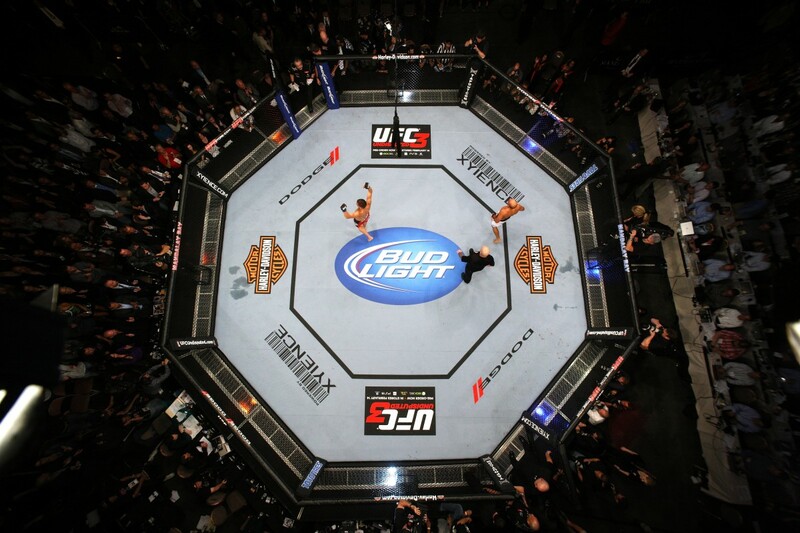 So, I only shot the Cerrone/Siver bout from up top. That one, as well, was a quick one. Nonetheless, I came away with a few good shots. We also mounted an overhead remote camera again in the lighting grid. This time, we went much further out towards the center of the Octagon to achieve the “straight over top” look as best as possible. I used a 14mm lens mounted on a Canon EOS 1DS Mark III. Luckily, we had some good fights and good celebrations. I think we came away with a good amount of winners from the overhead. It’s always a gamble, and you can never plan on it being successful. But, when it is, it gives you a good feeling of accomplishment. I wasn’t able to shoot much of anything for the three main fights, due to the internet dropping out in the arena and having to relocate my edit station to the production truck outside the arena. I did shoot a quick shot of BJ Penn’s entrance with the 400mm from the floor. I love that lens. Can’t wait to try the new version.